The bright and airy living room is the perfect spot to relax next to the fireplace. 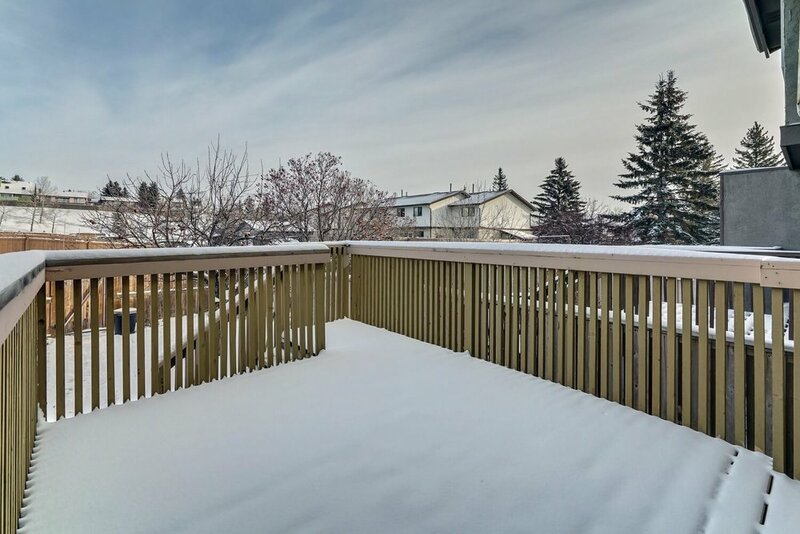 Meet ROLAND - The Ranchlands Town Home. This charming two bedroom, 5-level split has recently been refreshed with a complete repainted of the interior and new flooring on the upper levels. The bright and airy living room is the perfect spot to relax next to the fireplace. Enjoy spending your summer evenings on the generous rear deck and admiring your own private backyard complete with an apple tree. The hardwood floors continue from the living room into the functional U-shaped Kitchen and throughout the third level and powder room. There's plenty of space for a full sized table in the dining room. The upper levels feature the master bedroom, second bedroom, den, 4 piece bathroom and plenty of storage. The den can be easily converted into a third bedroom, making this an ideal home for a growing family. Other recent upgrades include a high-efficiency furnace, windows, garage door, and new interior light fixtures. The upper levels feature the master bedroom, second bedroom, den, 4 piece bathroom and plenty of storage.